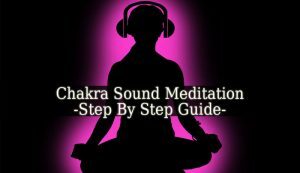 Chakra Sound Meditation – this meditation is mostly based on sound frequencies and vibrations. For this meditation you will need to find online the music with different vibrations for each chakra. Chakra Sound Meditation is a relatively long meditation, and it is not a meditation that you practice daily. It is more likely a weekend meditation. Which balances the chakras. And it sends you into a peaceful mindfulness. The music you can find easily online, but not the guidance. This meditation is 1 hour long. And it requires some acts. The first stage of this meditation lasts for 45 minutes. And the last one for 15. You start the first stage by sitting comfortably. Any posture you choose, keep your spine straight. Another thing to be careful for is to breath into your belly. Close your eyes. Focus on the sounds and the vibrations. Each chakra has its sound. You start with the Root Chakra. Visualize how the sound vibrates that chakra. The sound will get in a higher pitch with each chakra. Repeat the visualization for each. And when you got to the Crown Chakra, the sound will get lower again gradually. Then higher again, and so on. The process will be repeat 3 times. With short pauses between each sequence. When the first stage is done, you can start the last one. It is a state of mindfulness. Observe your body and how it feels. Don’t judge, just observe. After 15 minutes, you can open your eyes, but don’t get up yet. Take a few more breaths, and get up when you think that you are ready. Then drink a big glass of water. A glass of clean water is recommended after every meditation. This Chakra Sound Meditation is very important, not only for mindfulness, but also for healing. Many diseases and health conditions are provoked by imbalances in the chakras. Which influence the energy flow in the body. And stops or slows down the healing process of the body. Therefore, this meditation is recommended to you if you have an illness, you need healing and even when you are stressed or need an our of peace.